We have a problem! Outlook 2010, according to Campaign Monitor, is going to continue to use the crippled MS Word layout engine. They adopted this as the status quo for Outlook 2007 and promptly set rich email with CSS, etc., back a number of years, and are showing no great sign of diverging from this path. However, there is hope! Campaign Monitor have started a website in conjunction with their “Email Standards Project” — essentially a standards advocacy website. They need your support now more than ever. 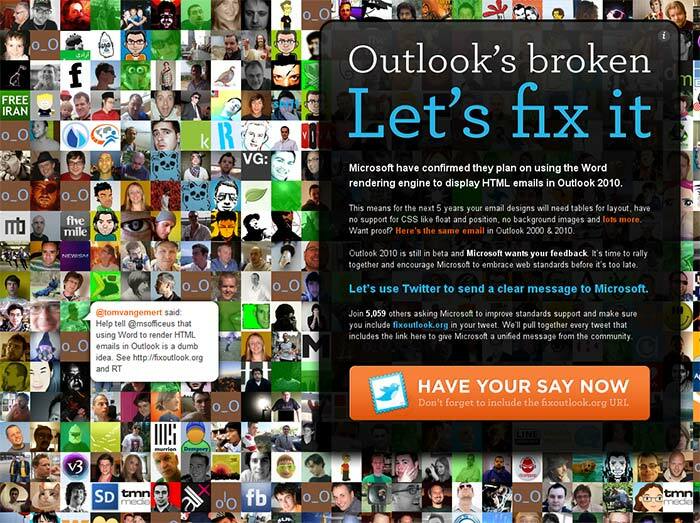 FixOutlook.org aims to collate the community’s discontent with this decision using Twitter to change Microsoft’s policy decision on this one before it’s too late and we’re stuck with yet another five-ten years of inferior email authoring! If you’re a Twitter user, it’ll take two seconds to retweet and show your support. This is a really important issue for anyone involved in email marketing, and well worth taking the effort to make some noise about. Essentially, if we don’t get off this track it’ll be years until it is possible to drop support for these inferior clients (as is the case with IE6, now) and we’ll all be dealing with sub-par mailing authoring, cross-compatibility, and display issues for a while to come.